Canon Hunter, son of W.H. 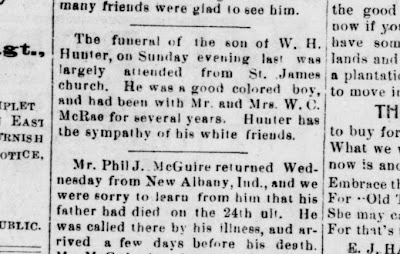 Hunter, was the innocent victim of an accidental shooting at the home of T.J. Powell during December 1901. Canon was the "house boy" for a Mrs. McRae, who was a neighbor of T.J. Powell. In addition to Canon's death, another child, McFarland Long (son of Dr. W.E. Long) was injured but lived. A third child, Joe Powell, son of T.J. Powell, shot the gun in the incident but was unharmed. Below is a short obituary for Canon. Source: East Carroll Parish, LA Banner Democrat, December 7, 1901, Image 2. 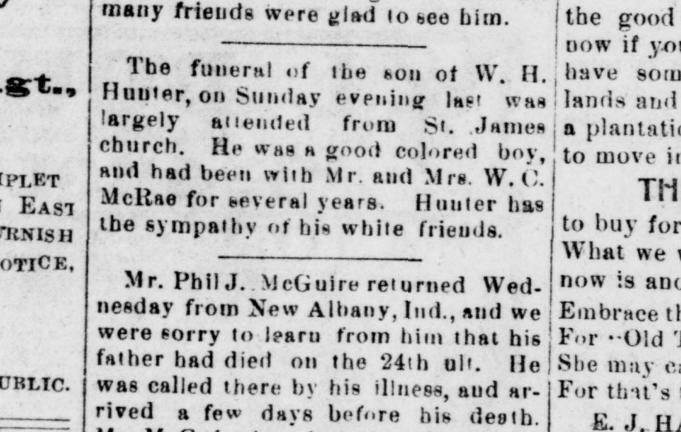 The event was covered by the Banner Democrat and can be read here, which is the same page as the obituary above.